Back with another bite-sized food and beer combination to blow your socks off. I’ve written before about my love for simplicity, maybe the fact it’s a recurring theme says something about me, but it’s the inspiration behind today’s combination too. I love bread, a lot, maybe too much in fact; I could eat a good loaf of bread on its own, probably in one sitting if I really tried. But when you take a good, freshly baked loaf and combine it with some strong Cheddar, you move things on to a new level. Two of the simplest things in world, but together they’re like Mr and Mrs Perfection. Less is more they say, and in this instance, I’m inclined to agree. A self contained plateful of delicious comforting nourishment that wouldn’t benefit from any further addition, beautiful simplicity. Blowing away any sense of occasion, need for meal table rule or even a knife and fork, leaving you with the joyful act of eating in its purest form. The more hungrily you can scoff it down the better, tearing hunks off the loaf with hands is essential and only thickly cut slabs of cheese will do. And it's that nourishment factor that inspires my beer choice. Something thick and hearty, chewy and filling, bread in liquid form. Something like an old school English IPA, Worthington White Shield, with its substantial body and mouthfeel, its rugged malty backbone, enough to stand shoulder to shoulder with any loaf of bread. Residual sweetness in the beer that will accent the sweet creaminess of the cheese and spicy, peppery, dusty English hop varieties that will compliment the earthy, wild, mustard seed qualities of a traditional, unpasteurised Cheddar. Those Trappist monks know what they're doing when it comes to nourishing beer. 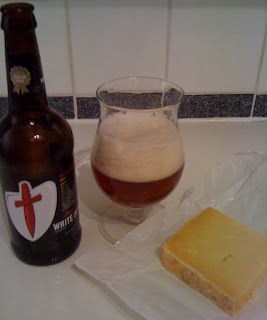 Michael Jackson wrote: "The notion of specialising in strong brews dates from the time when these [Trappist] beers were regarded as 'liquid bread' to sustain the body during lent"1, and if you fancy going a bit continental with this food pairing, you could do much worse than look to the monasteries of Belgium and Holland. Rochefort 8 for example will toe the same line as Worthington White Shield, substituting hops for a sweetness built around dried fruit, figs and plums. The carbonation lending a hand to cut away the creaminess of the cheese and add a lightness to the meal. Or hop across the border for a German equivalent, a Bock or a Doppelbock, made with copious amounts of malt to produce a beer with lager roots but considerable substance too. Paulaner Salvator or Ayinger Celebrator are good choices, of the former Zak Avery writes: “Originally brewed as ‘liquid bread’ sustenance during Lent, Salvator (Latin for ‘saviour’) is an orange-brown beer with a luscious, nourishing malt character. Medium-sweet on the palate, with some dried fruit, toffee and a faint hoppy spiciness. For many, the textbook example of a doppelbock”2. The same themes of hop-spice, complex malty sweetness, bitterness and carbonation to play off the mustard, cream and sweetness of the cheese. Malty, sweet, chewy beer and strong Cheddar cheese; a match made in heaven. 1 Taken from an article originally printed in The Independent, Feb 2nd 1991. 2 Tasting notes from 500 Beers by Zak Avery.